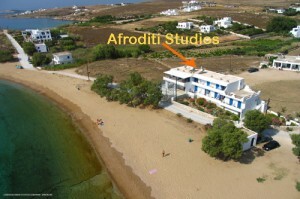 At Afroditi Studios you can enjoy your holidays in a peaceful and clean place which is just front of the beach. All units have their private exterior entrance and comfortable and shaded verandas with a panoramic view of the sea. Afroditi Studios are located in Logaras, directly on the beach. Built on two levels in 1985 and renovated in 2006, it offers 7 studios and 6 rooms that can accommodate 2 or 3 persons and two apartments that can accommodate 4 or 6 persons. APT 1-(70 m2) with two bedrooms with air conditioning and two shower rooms/wc, on the top floor. APT 2 (125 m2) -with three bedrooms with air conditioning and three shower rooms/wc, on the ground floor, which will be completed. for the season 2018. The two apartments can be rented separately or together. During high season period of rental is from Saturday until Saturday. At the entrance of the house, there is a built-in barbecue for the use of the residents of the two apartments.